This manuscript describes the results of an HPLC study for the determination of the flavan-3-ol monomers, (±)-catechin and (±)-epicatechin, in cocoa and plain dark and milk chocolate products. The study was performed under the auspices of the National Confectioners Association (NCA) and involved the analysis of a series of samples by laboratories of five member companies using a common method. The method reported in this paper uses reversed phase HPLC with fluorescence detection to analyze (±)-epicatechin and (±)-catechin extracted with an acidic solvent from defatted cocoa and chocolate. In addition to a variety of cocoa and chocolate products, the sample set included a blind duplicate used to assess method reproducibility. All data were subjected to statistical analysis with outliers eliminated from the data set. The percent coefficient of variation (%CV) of the sample set ranged from approximately 7 to 15%. Further experimental details are described in the body of the manuscript and the results indicate the method is suitable for the determination of (±)-catechin and (±)-epicatechin in cocoa and chocolate products and represents the first collaborative study of this HPLC method for these compounds in these matrices. The use of cocoa has been documented for almost 4,000 years. The first population thought to consume the material was the Mesoamericans [1, 2]. In the past decade there has been increasing interest and numerous publications on the putative health effects associated with the moderate consumption of cocoa and chocolate products [3–5]. In a parallel fashion, several groups initiated studies into the potential agents responsible for cardiovascular effects with the flavanols, (±)-catechin and (±)-epicatechin being candidate compounds . The growing interest in these compounds resulted in a plethora of methods for quantification in various foodstuffs including tea, wine, grapes and chocolate. While other analytical methods have been used, HPLC was the predominant method developed [7–13]. A thorough literature search using Google and Pubmed resulted in thousands of citations on polyphenol analysis and almost 900 citations on flavanol analysis by HPLC in chocolate, indicating the recent explosive growth in methods for these analytes. Considering the increased interest in the cocoa flavanols' potential cardiovascular effects, a standard quantification method would be pertinent for accurate determination of dose-response effects in clinical trials. There is both an ISO and an Institute for Nutraceutical Advancement (INA) method for flavanols in tea, but not yet a standard method for flavanol quantification in chocolate and cocoa [14, 15]. With this as background, the National Confectioners Association (NCA) convened an analytical chemistry working group to develop a consensus HPLC method. This group conducted a collaborative study using samples provided by NCA to establish a method to quantify (±)-catechin and (±)-epicatechin in cocoa and chocolate and make it available to the industry. This method is applicable for the analysis of (±)-epicatechin and (±)-catechin in cocoa powder, chocolate liquor and formulated chocolate products. This ring trial only included pure chocolate; any products containing inclusions (such as fruit or nuts) may not be appropriate for this method due to potential interference. This method determines the (±)-catechin and (±)-epicatechin content of cocoa and chocolate products. Fat is removed from the sample in order to prevent potential interference and protect the column by using multiple hexane extractions. Defatted samples are then dried for subsequent extraction of analytes. Defatted, dried samples are extracted, with sonication, at 40°C for 15 minutes using an acetone: water: acetic acid (70: 29.5: 0.5) solvent mixture. Extracted samples are then centrifuged to remove insoluble materials and brought up to a defined volume. The extracts are filtered into HPLC vials for chromatographic analysis. (±)-Catechin and (±)-epicatechin are separated by a reverse phase mechanism on a C18 column with an acidic acetonitrile-water mobile phase gradient. Analytes are detected and quantified by their fluorescence, with excitation at 280 nm and emission at 315 nm. (g) Mobile Phase A: 0.2% Acetic Acid in Water. Add 2 mL Acetic Acid to 1 L Water. (h) Mobile Phase B: 0.2% Acetic Acid in Acetonitrile. Add 2 mL Acetic Acid to 1 L Acetonitrile. (i) Standards: (±)-Catechin hydrate, purity = 98%, Sigma-Aldrich C1251-5G or equivalent; (±)-epicatechin, purity = 98%, Sigma-Aldrich E4018-1G or equivalent. Certificate of analysis from supplier is required for purity correction of each new lot number. (a) (i.) Stock standard solution A (approx 1000 µg/mL): Into a 50 mL volumetric flask, accurately weigh approximately 50 mg (±)-catechin hydrate and 50 mg (±)-epicatechin and record the weights. Add extraction solvent and mix or sonicate to dissolve. Bring to 50.00 mL with extraction solvent and mix. Label as Stock standard A. (ii.) Stock standard solution B (approx 100 µg/mL): Pipette, using a Class A volumetric pipette, 5 mL of Stock standard A into a 50 mL volumetric flask and dilute to volume with extraction solvent. Label as Stock standard B. Stock standard A use concentration as is. Stock standard B concentrations will require multiplication by an additional 1/10 factor. (c) Fluorescence Detector Sensitivity Assessment: Stock Standard Selection (Stock Standard Solutions A, B): When running this method for the first time inject the appropriate injection volume, 10 µl, of Stock Standard A and B onto the HPLC system under the conditions provided in Section G. Examine the detector response for the two concentrations provided. Choose the most concentrated stock standard solution that does not saturate the detector as the Stock Standard with which to proceed. Discard the other stock standard solution. If proceeding with stock standard B, for future analysis note that the stock standard preparation procedure can be modified by preparing a stock standard solution of 0.1 mg/mL to save one dilution step. (d) Reagent Blank: Use extraction solvent for the blank. (e) Working standards: Prepare Working Standard Solutions from the chosen stock standard. Add indicated amounts of appropriate working standard (100 or 1000 µg/mL) to a 10 mL volumetric flask; bring to volume with the extraction solvent. Transfers should always be made with Class A volumetric pipettes. Alternatively test tubes can be used and the remaining extraction solvent for dilution to 10 mL can be added with Class A volumetric pipettes. See an example of the working standard dilution scheme in Table 1 below. (a) Accurately weigh approximately 2 grams of each finely divided/grated milk chocolate sample or 1 gram for cocoa powders/baking chocolate/dark chocolate samples into a labeled, tared 50 mL disposable centrifuge tube. Record the weight of the sample W SAMPLE. (b) Add approx. 40 mL hexane (dispenser) and cap tightly. (c) Mix until the sample is completely dispersed (check visually). (d) Centrifuge for 5 minutes at 2500 × g.
(e) Carefully decant and dispose of the hexane phase immediately. (f) Repeat defatting steps (b) to (e) one additional time. (g) Remove the cap and allow the residual solvent to evaporate in an appropriate fume hood until remaining hexane has evaporated (e.g. over night). Alternately, a stream of nitrogen may be used to accelerate the drying process. Continue with whole sample remaining in the centrifugation tube. (a) Add 2 glass beads to the centrifuge tube containing the dried, defatted sample. (b) Add 9 mL of extraction solvent (dispenser) and vigorously shake the sample to break centrifugation pellet. Sample does not need to be completely suspended yet. Shake headlong, if necessary gently tap several times. (c) Place in an ultrasonic bath at 40°C for 15 minutes in total. After 5-10 minutes of sonication, remove sample from bath and handshake again until sample is completely suspended (check visually). Alternately, vortex sample. (d) Remove the sample from the ultrasonic bath, centrifuge at 2500 × g for 5 minutes. (e) Carefully and slowly decant the liquid portion into a 20 mL Class A volumetric flask (wide neck, if possible). (f) Repeat the extraction steps (b) to (d) one additional time. Decant the liquid from the second extraction into the same 20 mL volumetric flask. (g) Bring to volume with extraction solvent. (h) Assemble a Syringe and Syringe Filter. Filter approximately 1 mL of sample into a HPLC Vial. (i) Analyze by HPLC as described in Section G.
(b) Flow rate: 0.65 mL/min for 3 mm i.d. column; Alter flow rate to maintain linear flow for other column dimensions. (e) Gradient Elution: See Table 2for example gradient conditions. HPLC columns differ in their selectivity for these compounds. Gradient conditions should be altered as needed to achieve resolution of (±)-catechin and (±)-epicatechin from interfering peaks. (f) Concentration of analytes in sample extract: Check if concentration of analytes in sample extract lie within their calibration ranges. If necessary, dilute and re-run extraction solution. (g) Check sample: Check sample by re-runing mid point calibration curve in middle and at end of sample sequence. Calculate the mean, standard deviation and coefficient of variation (%CV) of the peak areas. Integrate peak area for quantitation. If peak areas of analytes in sample extracts are above calibration curve, dilute sample extract solution with extraction solvent accordingly. If peak areas of analytes in sample extracts are below calibration curve, repeat sections E and F and increase sample weight accordingly. An HPLC column which fully resolves the analytes of interest may be used for the method. Gradient slope, flow rates and injection volumes may be altered as appropriate to accommodate columns of differing dimensions. (a) System Artifacts: As the first two injections of the day, analyze the blank standard twice in succession. 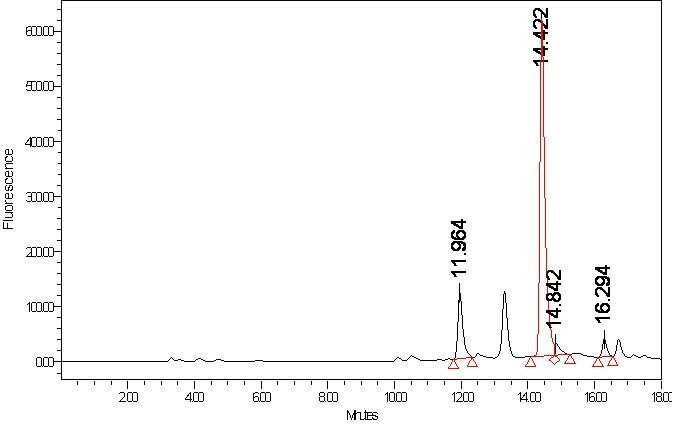 Inspect the two chromatograms for artifact peaks from the HPLC system. Artifacts in the first chromatogram, absent in the second, indicate a buildup of impurities on the system. Artifacts present in both runs indicate impurities expected in every run. If the first chromatogram shows artifact peaks but the second chromatogram does not, inject a blank solution as the first sample in every analytical set. The presence of artifact peaks indicates impurities in the HPLC solvents, the needle wash system, or carryover in the injection system. These problems, if present, should be corrected. (b) Carryover: Inject Standard 5 and then the blank. Carefully examine the blank injection for carryover peaks. Calculate the carryover of any peaks seen in the blanks as a percentage of the concentration found in standard 5. Carryover of standard 5 to the blank injection should be less than 0.1%. (c) Linearity of the standard curve: Analyze each of the 5 standards, and construct a standard curve. The R2 of each standard curve should be greater than 0.9990. If this linearity is not achieved, prepare fresh standards. (d) System precision: Analyze five replicate analyses of standard number 3. Calculate the concentration of each analyte and calculate the mean, standard deviation and percent coefficient of variation (%CV) of the results. The %CV for all peaks should be ideally less than 2%. Samples for analysis were prepared by the NCA Study Director and submitted as blind samples to five participating laboratories. Samples consisted of cocoa, dark chocolate, milk chocolate and NIST SRM  Baking Chocolate having certified values for (±)-catechin and (±)-epicatechin. One dark chocolate samples was used as a blind duplicate to assess method repeatability. Quantification was performed using the external calibration method as described in the method with all laboratories reporting regression coefficients in excess of 0.99 with the labs equally divided whether calibration was forced through zero. All results were submitted to the Study Director using the form that was provided with the samples and with all data statistically evaluated. Samples were run in duplicate or triplicate. Furthermore each data set was evaluated using the Q-test to test for outliers with some data being eliminated. The results can be seen in Table 3. N/A* These results were eliminated due to designation as outliers by the Q-test for outliers . Figure 1 is a sample chromatogram provided from one laboratory of a dark chocolate extract. Instrumental conditions are as described in the methods section. Chromatogram of Dark Chocolate Extract Analyzed Under Method Parameters. Peak at 11.964 is (±)-catechin while peak at 14.422 is (±)-epicatechin. Each laboratory also provided information about LOD (Limit of Detection) which was in pure solvent in the 40-50 ng/mL. The LOQ (Limit of Quantitation) ranged from 1- 2 μg/g Repeat injections of standards were also accomplished with %CVs reported in the 1-4% range. The NIST (National Institute of Standard Technology) reference values for (±)-catechin and (±)-epicatechin in SRM (Standard Reference Material) 2384 are 245 +/- 51 (μg/g) and 1220 +/- 22 (μg/g) respectively with the data from this study indicating value of 254 +/- 23.5 (μg/kg) and 1137 +/- 68 (μg/kg) which are within the acceptable range of determinations established by NIST. While recovery studies have become a default method to assess method accuracy according to Swartz and Krull, the analysis of an established SRM is by itself a generally accepted method of validation . Additionally, guidance from AOAC on methods validation indicates that spiking is not a desirable method to assess method accuracy as spiking solutions tend to be easily extractable hence the choice of the NIST standard to evaluate the method. The sample labeled Milk Chocolate 1 is an example for a product containing very low amounts of the target analytes. With the analyte concentration in the sample extract at their lower limit of quantification and the chromatographic performance negatively affected by co-extracted matrix compounds the applied method operates at its limit. Hence the sample was not included in the statistical evaluation of the method. That being said, no issues related to complexation of polyphenols with milk reported by some researchers were seen . The %CV ranged from 7-15% in this study. Laboratories used a column that satisfied the requirements of U.S. Pharmacopeia, previously described in methodology section . The method was reviewed and compared with recommendations of Swartz and Krull. Finally, while the data in Table 3 may seem excessive to the casual observer, it is well within the parameters established by AOAC for another complex analyte . The literature reports on the use of numerous solvents for the extraction of flavan-3-ols including mixtures of methanol, acetone, water and acid therefore the solvent combination used is within established parameters [21, 22]. Furthermore, a variety of HPLC detector types have been used including UV, Diode Array, Mass Spec and fluorescence [23–27]. The choice of fluorescence detection is within established analytical parameters for this determination as it offers selectivity and sensitivity for these compounds with the identity of the peaks being established by the use of authentic standards. The data from these studies indicate the proposed chocolate and cocoa method is suitable as an HPLC method for the determination of flavanol monomers, (±)-catechin and (±)-epicatechin in chocolate and cocoa. The method is the first such method developed by an industry group such as NCA for this purpose. The authors would like to thank the following company's laboratories for their participation in validating the method by testing commercial samples: The Hershey Company, Archer Daniels Midland Company, Kraft Europe, Kraft-Cadbury and Barry Callebaut. NCA is especially grateful to the following individuals for their commitment throughout this process: Jeff Hurst, Mark Payne, Lindo Groff, Mark Collison, Eva-Maria Berndt, Verena Jendreizik, Alison Branch and Olivier Nuytten. AB selected standard and sample preparation methods, chromatography parameters and suitable commercial samples. LS distributed samples to participating laboratories, collected and analyzed data and prepared the manuscript. All authors read and approved the final manuscript.